In an interview with Kevin Smith, writer and television producer Paul Dini complained about a worrying trend he sees in television animation and superhero shows in particular: executives spurning female viewers because they believe girls and women don't buy the shows' toys. Vi at agelfeygelach transcribed part of Dini's conversation with Smith on the Fat Man on Batman podcast, during which he talks about the cancellation of Young Justice, Green Lantern: The Animated Series, and Tower Prep. 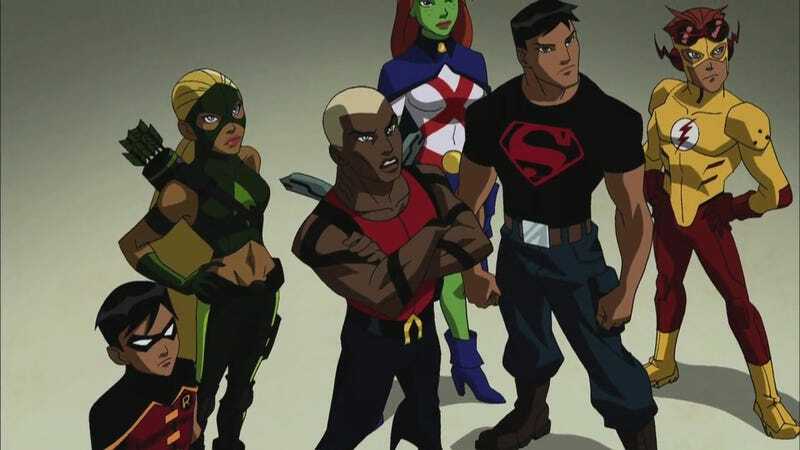 He explains that studios are looking to capture younger male viewers, "boys who are into goofy humor, goofy random humor," and that they aren't interested in the older Young Justice audience. DINI: "They're all for boys 'we do not want the girls', I mean, I've heard executives say this, you know, not [where I am] but at other places, saying like, 'We do not want girls watching this show." SMITH: "WHY? That's 51% of the population." DINI: "They. Do. Not. Buy. Toys. The girls buy different toys. The girls may watch the show—"
DINI: "That's the thing, you know I hate being Mr. Sour Grapes here, but I'll just lay it on the line: that's the thing that got us cancelled on Tower Prep, honest-to-God was, like, 'we need boys, but we need girls right there, right one step behind the boys'—this is the network talking—'one step behind the boys, not as smart as the boys, not as interesting as the boys, but right there.' And then we began writing stories that got into the two girls' back stories, and they were really interesting. And suddenly we had families and girls watching, and girls really became a big part of our audience, in sort of like they picked up that Harry Potter type of serialized way, which is what The Batman and [indistinct]'s really gonna kill. But, the Cartoon Network was saying, 'F***, no, we want the boys' action, it's boys' action, this goofy boy humor we've gotta get that in there. And we can't—' and I'd say, but look at the numbers, we've got parents watching, with the families, and then when you break it down—'Yeah, but the—so many—we've got too many girls. We need more boys.'" DINI: "And then that's why they cancelled us, and they put on a show called Level Up, which is, you know, goofy nerds fighting CG monsters. It's like, 'We don't want the girls because the girls won't buy toys.' We had a whole… we had a whole, a merchandise line for Tower Prep that they s***canned before it ever got off the launching pad, because it's like, 'Boys, boys, boys. Boys buy the little spinny tops, they but the action figures, girls buy princesses, we're not selling princesses.'" The Toy Industry Association has annual sales data up on its website, although I don't see a spot where it breaks down sales data by gender. One thing that is interesting is that, in 2012, action figures and roleplaying toys accounted for $1.39B in sales, while dolls, which are typically aimed at girls, accounted for $2.69B in sales.